Researchers in the UK have come across a massive collection of methyl surrounding a distant star. Astronomers at the Jodrell Bank Observatory in the UK, through the use of their recently improved MERLIN radio telescopes, have discovered a giant cloud of methanol (otherwise known as methyl alcohol) bearing a vintage of roughly 7 billion years. Those hoping the discovery might find its way into a few beverages would be better served looking a little closer to home, however. Though the cosmic cloud spans 463 billion km (that’s about 288 billion miles) and contains enough alcohol to make trillions of bottles of beer, methanol is not safe for human consumption—ethanol is the form of alcohol found in drinks—and is capable of causing death in volumes as small as 30 mL. Of course, actually traveling to the cloud would be a feat modern science is incapable of accomplishing in the first place. 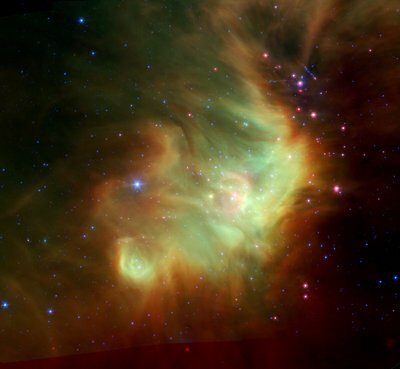 In monitoring methyl masses such as this one, researchers are more interested in how the clouds can play a role in the formation of heavenly bodies than the mixing of cocktails. The newly discovered cloud appears to be rotating around a central star in much the same fashion as planets develop around young stars. With the MERLIN telescopic network’s newest enhancements, researchers were able to study the cloud in greater detail than ever before possible, monitoring the radiation, temperature, pressure, and magnetic fields of the observed methyl mass. This data can be used for the testing of theories on how stars are created out of primordial gasses. Future observations are planned to gain a greater understanding of the process. Subject: LongIsland.com - Your Name sent you Article details of "Scientists Discover Giant Alcoholic Cloud"